Matcha Ninja is a Toronto based start up with one goal. To bring raw organic matcha to the masses. 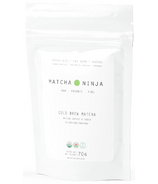 Matcha Ninja leaves are specifically selected tencha leaves that are de-steamed and finely ground for a longer period than regular matcha to allow for super soluble and superior tasting matcha. Raw. Matcha Ninja leaves are specifically selected tencha leaves that are de-steamed and finely ground for a longer period than regular matcha to allow for super soluble and superior tasting matcha. Raw. Organic. Fuel.